There are millions of women all across the world asking themselves that very question at this moment. Studies have shown that about 40 percent of women will start to show signs of hair loss by the time they reach the age of 40. And in some cases, those signs of hair loss can be painfully obvious. They can leave women searching for answers as far as how to regrow their hair. If you currently find yourself in this predicament, you might be wondering why hair loss is happening to you. Here are 9 triggers that could be causing your hair loss. Stress is bad for just about every single part of your body. From your heart to your brain to, yes, your hair, too much stress can cause lots of problems. If you’re going through a particularly stressful time in your life, it can serve as a shock to your normal hair cycle. Your hair might start to shed uncontrollably when this happens or stop growing for a period of time. The good news is that you can reverse this by eliminating stress from your life. Within just a few months, you should notice your hair growing normally again. Are there other women in your family who have suffered from hair loss throughout their lives? It could mean you’re more likely to lose your hair, too. Conditions like female-pattern hair loss are believed to be hereditary. It can cause your hair to thin and the part in your hair to widen. Talk to other women in your family about hair loss if you’re experiencing it. There’s a chance they might be able to shed some light on why you’re dealing with it. Your diet plays an important part in the health of your hair. If you’re not eating foods with the right nutrients, you will likely notice a change in your hair over time. For example, if you’re not taking in enough vitamin C, you might notice your hair becoming brittle. That’s because vitamin C helps your body synthesize collagen, which is a key ingredient in hair growth. Or if you’re not taking in enough zinc, you might notice your hair growing slower than normal. That’s because zinc helps the oil glands that are situated around your hair follicles to work properly. To get more vitamin C in your diet, eat things like oranges, cauliflower, and tomatoes. To get more zinc, eat nuts, sweet potatoes, and chickpeas. This could very well make your hair loss issues go away. In theory, shedding a few pounds should be a good thing. But if you lose a bunch of weight too quickly, it can actually take a toll on your body and on your hair. When you take part in a crash diet or do something else that results in extreme weight loss, it’ll put an incredible amount of stress on your entire system. And we’ve already discussed how stress can affect your hair. You’re better off losing weight at a slower pace to give your body the time it needs to adjust. This will reduce the chances of your hair falling off along with the pounds you’re losing. Pregnancy itself is actually great for your hair. When you’re pregnant, your body produces a lot of estrogen, which will make your hair feel fuller. But once you’ve given birth, your estrogen levels will come crashing back down to earth and eventually return to normal. Your body will temporarily perceive this as you having a lack of estrogen, which will throw off your normal hair cycle. It’s good for women to take in a lot of vitamin B, vitamin C, vitamin E, and zinc after having a child. It’ll prevent an estrogen plunge from leading to a lot of hair loss. Do you pull your hair up in a tight bun every morning before work? Or do you comb your hair incessantly at the end of every day? You might think you’re taking care of your hair. But all that styling can actually make some of it fall out. Rather than overstyling your hair, you’re better off treating your scalp day in and day out to keep your hair healthy. You can do this by massaging your scalp and rubbing things like olive oil and castor oil into it. If you’re currently taking blood thinners, blood pressure drugs, or other medications, they could be causing hair loss to occur. Anytime you experience any change to your body when you start taking a new medication, talk to your doctor about how that medication might be affecting you. Your doctor may be able to change your dosage or recommend a different medication that won’t have such a profound effect. Working out is good for your body. But too much working out can be detrimental to it and cause hair loss if you’re not careful. When you overexercise, your body won’t have the energy required to tackle tasks like regrowing hair. Try scaling back your workouts and taking in enough nutrients when you work out to avoid this situation. About 200,000 people suffer from a condition called trichotillomania every year. 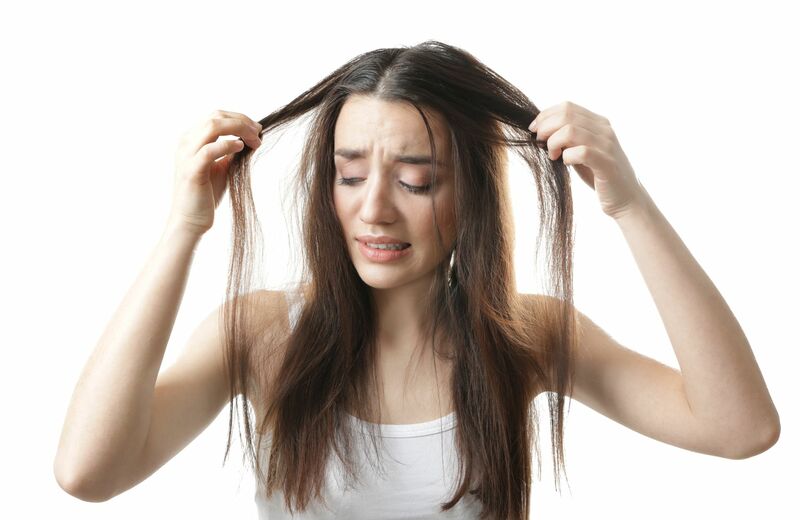 Those who have it pull their hair compulsively and, in some cases, end up pulling patches of hair out. Trichotillomania has been classified as a mental health disorder. Consider speaking with your doctor immediately if you feel as though you might be dealing with it. “Why is my hair falling out?” is a question no woman wants to ask. But it is a question you should start to ask if you have noticed hair loss. You might be able to get to the root of your problem and stop losing your hair by making a simple life change. You also might be able to use products designed to dramatically reduce thinning hair. They’ll allow you to get back to enjoying your hair again rather than dreading what you’ll see when you look in the mirror. Read our blog for further information about hair loss and the steps you can take to combat it.